Makes 4 first course servings or 6 cocktail servings. One of my favorite spring vegetables is asparagus. It is a great, versatile vegetable that goes well with an afternoon glass of wine or can be served as a light first course or as a tasty side dish. This particular recipe is delicious with fish, poultry or meat. 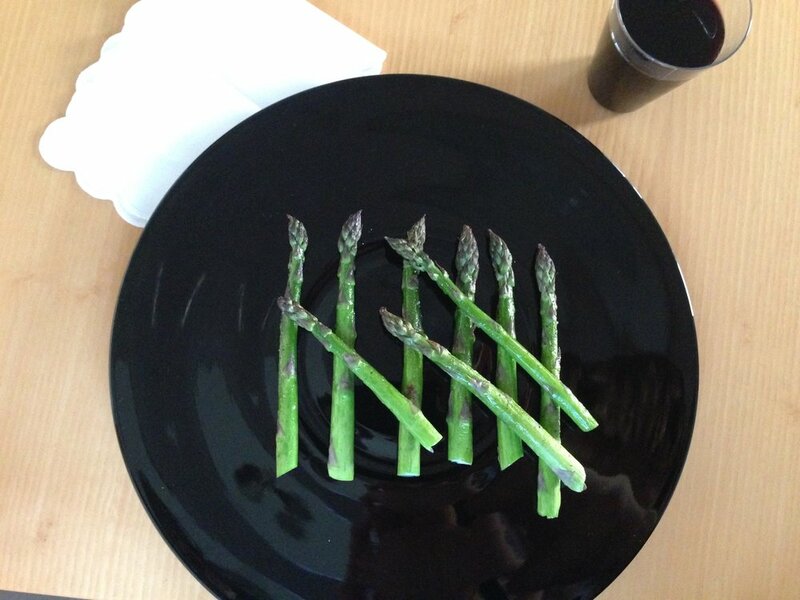 Hold each stalk of asparagus with both hands and snap it at the point where it breaks easily. Discard the rough bottom part and trim the ends at a diagonal to make them even. Rinse and pat dry. Preheat the broiler. Cover the whole broiling pan, which comes with most ovens, with heavy foil. Then I like to form a basket out of foil and place the basket on the broiler pan. This system makes cleaning up easy and quick. With your hands, grease the asparagus with olive oil, place in the foil basket and season lightly with salt and pepper. Broil as close to the heat as possible for about 3 minutes. The timing will depend on the thickness of the asparagus.